“I have been coughing and wheezing for days now. I find difficulty in breathing out especially while exercising. I also experience breathlessness whenever I inhale,” Nisha said while explaining her condition. After hearing her symptoms, Dr. Mayank decided to carry out some blood tests. In addition, some exercise tolerance tests and pulmonary function tests were suggested to get a proper diagnosis. Nisha was diagnosed with an obstructive lung disease. She was then advised further tests. What is an Obstructive Lung Disease? This is the first question Nisha asked after her diagnosis as she had little idea about the condition. 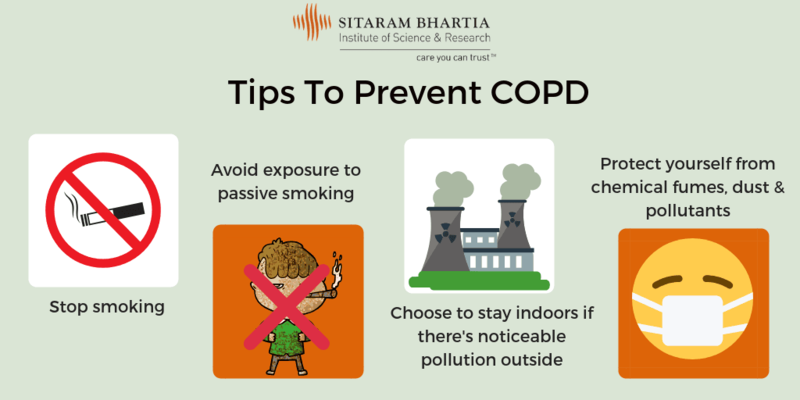 “Obstructive lung diseases are those conditions which make it difficult to breathe out. This means that the exhaled air takes longer to get out of your lungs giving you lesser time before breathing in again. As a result, breathlessness is a common symptom in these cases,” explained Dr. Mayank. Nisha finally understood why she felt breathless everytime she inhaled. She was advised other tests to evaluate the cause of the obstruction. “Obstruction in the airways or damage to the lungs is what causes an obstructive lung disease. Such obstruction can be caused by different types of lung conditions,” said Dr. Mayank. 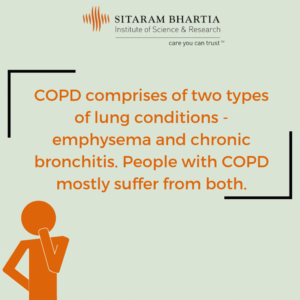 COPD is a lung disease which blocks the airflow from the lungs making it difficult to breathe. It is a condition which involves two kinds of diseases – emphysema and chronic bronchitis. “In chronic bronchitis, the bronchial tubes become narrow and inflamed. Lungs start producing more mucus which further blocks the narrow airways,” explained Dr. Mayank. Emphysema, on the other hand, occurs when the air sacs inside lungs get damaged and over-expand making it difficult to breathe out. “When we breathe in, the alveoli (air sacs) expand taking in air and deflate while exhaling letting air out. But in emphysema, the alveoli get damaged and lose their natural elasticity hence unable to push air out of lungs,. The air gets trapped inside giving lesser space for fresh air to come in,” Dr. Mayank elaborated. 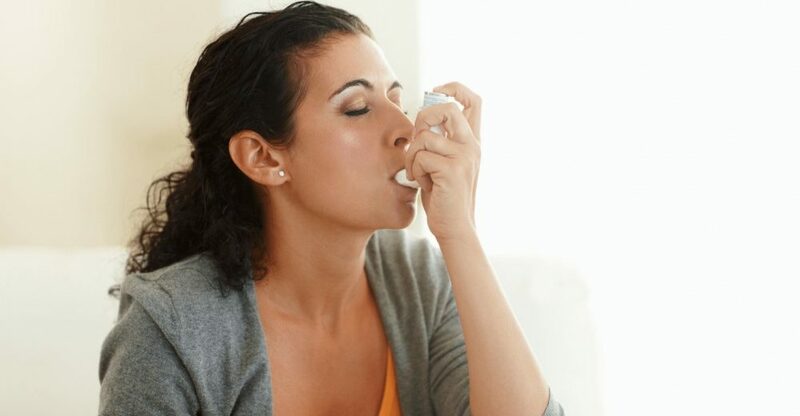 Asthma is a fairly common lung condition in which the airways become narrow, swell up and start producing extra mucus further narrowing the air passage often causing breathlessness and coughing. The cause of asthma is mostly not clear but it is probably due to exposure to irritants like pollen, dust etc. Cystic fibrosis is an inherited genetic disorder which causes severe damage to the lungs limiting the ability to breathe over time. In this disease, the defective gene causes a thick buildup of mucus in the lungs and other organs. This sticky mucus clogs the airways making it difficult for the air to pass through. It can eventually lead to respiratory failure. After further tests it was found out that Nisha was suffering from Chronic Obstructive Pulmonary Disease (COPD). “Will I ever be able to live without experiencing episodes of persistent cough and breathlessness?” Nisha asked. “Lungs suffer permanent damage due to conditions like COPD, which is why treatment should be started as early as possible. This also decreases the pace with which the condition worsens,” said Dr. Mayank. The most important thing in the treatment is to abstain from smoking. 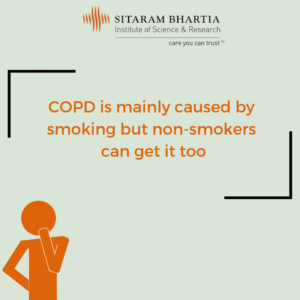 Regular smoking is one of the most common reasons behind COPD. Nisha was prescribed inhalers and certain medications to help her breathe properly and control her other symptoms better. She was also suggested pulmonary rehabilitation, which is usually led by a physiotherapist, to help her lead a more active and easy life. “Pulmonary rehabilitation is designed to reduce the symptoms of COPD and other obstructive lung diseases. It will optimize your ability to get on with your daily life, increase your participation in social activities and reduce the health care cost of the disease by stabilizing your condition,” explained Dr Aman Sachdeva, Consultant Physiotherapist at Sitaram Bhartia. This blog post is written with editorial inputs from Dr Mayank Uppal and Dr Aman Sachdeva.